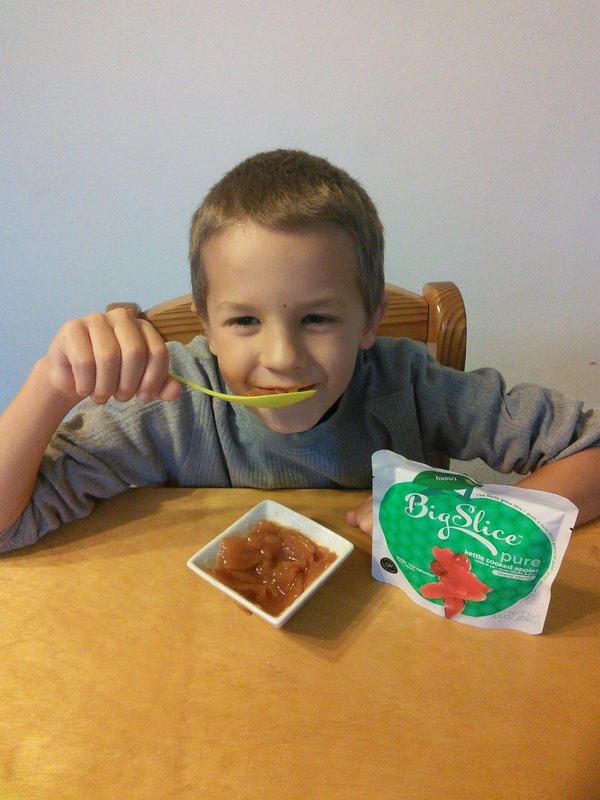 I am always looking for ways to get my kids to eat more fruit as for some strange reason they don't care for fruit. The only way I can get my boys to eat fruit is by making the eat it first before I give them the rest of their meal. Once they start eating the fruit, they then realize it tastes good and eat it all up. Maybe it is the extra chewing that is involved in fruit that makes my boys not want to eat fruit. I always have a variety of fruit in the house also. What is a mom to do? I have discovered a fun new way to get my boys to eat more fruit. I buy Big Slice apples and my boys finally beg for fruit. My boys think they are eating apple pie, but they are really eating healthy cooked apples that taste like apple pie. I think the colorful packages with delicious names on them helps too. I just love that these fruit pouches can be stored in the pantry and my boys can help themselves to fruit anytime they want. 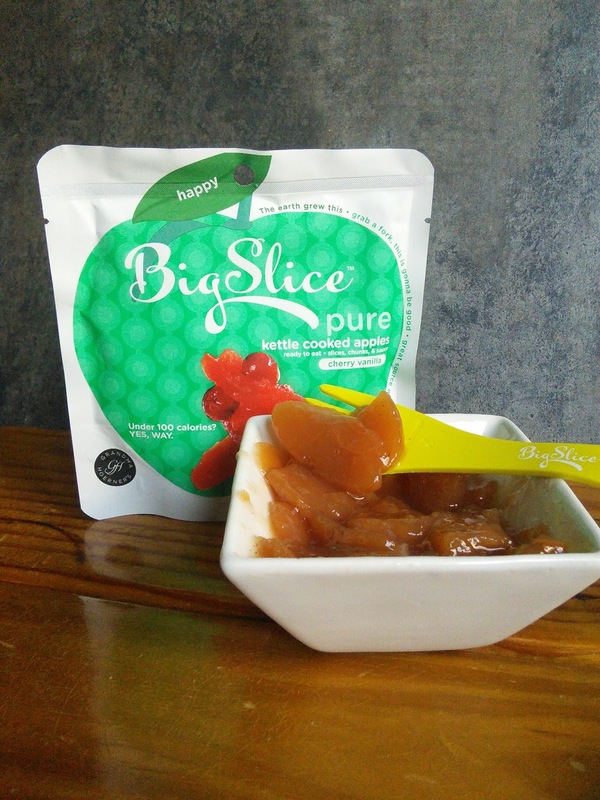 These pouches contain apples that are slow cooked in fruit juices. Some of the flavors contain other fruits to make them so delicious. 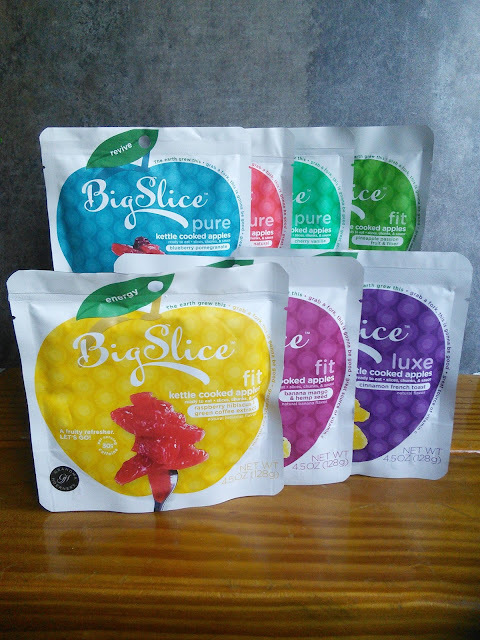 Big Slice apples come in 16 yummy flavors. 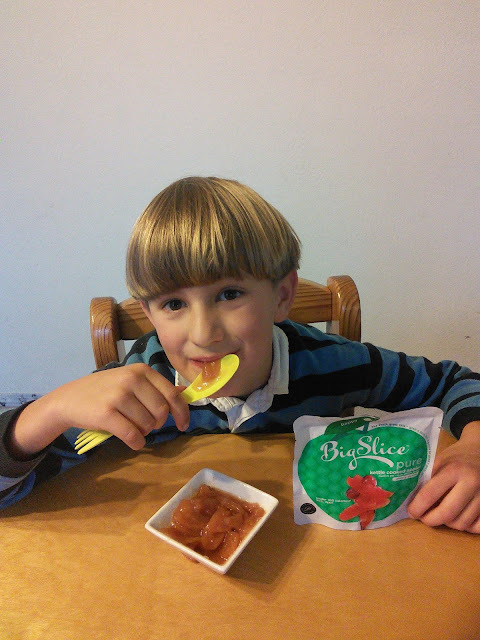 I was sent 14 pouches of Big Slice apples, 7 of the yummy flavors, and my boys and I had fun trying them all. I think cherry vanilla was our favorite with pineapple passion fruit being a 2nd favorite. My boys loved that they could eat the fruit right out of the package. These pouches would be so easy to take on the go too. Take a look at all the delicious flavors these apples come in. All the apples are gluten free, GMO free, and some even contain other superfood healthy ingredients like green tea, aloe and hemp seed. 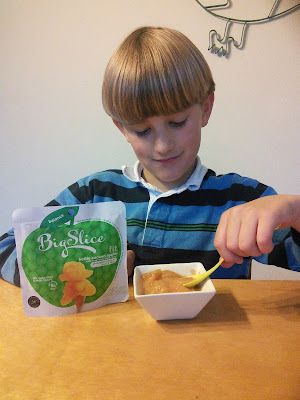 If my boys save me some of the Big Slice apples, I will add them to my yogurt or oatmeal. Next time I make waffles I will use the Big Slice apples instead of syrup for a healthy breakfast. They would be also great for smoothies. My favorite way to eat these apples is right out of the pouch. Thank goodness I can find these healthy wholesome apple slices at my favorite stores like Target, Costco, and Whole Foods, as I think I am going to have to buy more very soon. My hungry boys might just eat them all before I get a chance to have more. How can I say no, to buying more, when my boys are eating fruit. Just look at the smiles! 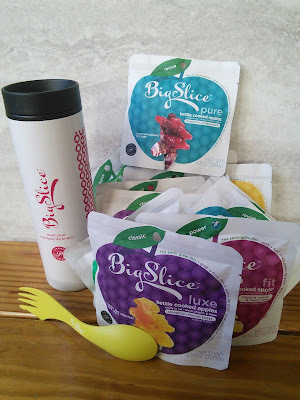 Check out Big Slice apples on their website and other social media for more information. Just enter on the below giveaway form and good luck! I would like the cherry! I would like to try chai. I would love the cherry apples! thanks for the chance to win! My favorite flavor it the apricot. I think I would like the natural flavor. I would go for the Pineapple Passion Fruit & Fiber flavor. I would like to try apricot. I would like to try the chai flavor. I'd like to try the natural flavor. wow there are a lot of yummy flavors to choose from. I would go with the natural flavor to start out with and add fromt here. I really would love to try them all :) but I am most excited about orange ginger!! Looks delicious! My kids would totally dig these. I'm aways encouraging fruits and veggies and this looks like a nice option for the picky eater. No wonder they love those. I would too. I like your idea to add it to oatmeal! A nice and healthy snacks for kids! I bet this tastes awesome with yogurt! Your little ones really seems to like them! That's great when you find healthy snack that they will actually have! Mmmm... kettle cooked apples sound really good. This would be a great snack for me right about now. That looks so yummy. I would love to try all flavors. Yum! This sounds so good, I would eat these as an alternative to dessert! Cherry apple please!!! My son will love this! Cherry apple would be the flavor I'd like to win. A healthy snack, OMG! I like it for my son, for sure he would love these. Cherry apple sounds delicious, that would be my favourite. I'd love to try 'em all! Too bad the giveaway is not available for my country. I love these, I actually tried them after winning them in a giveaway! They are so yummy and my girls loved them too. My favorite would be Orange Ginger flavor. My favorite flavor is Orange Ginger.